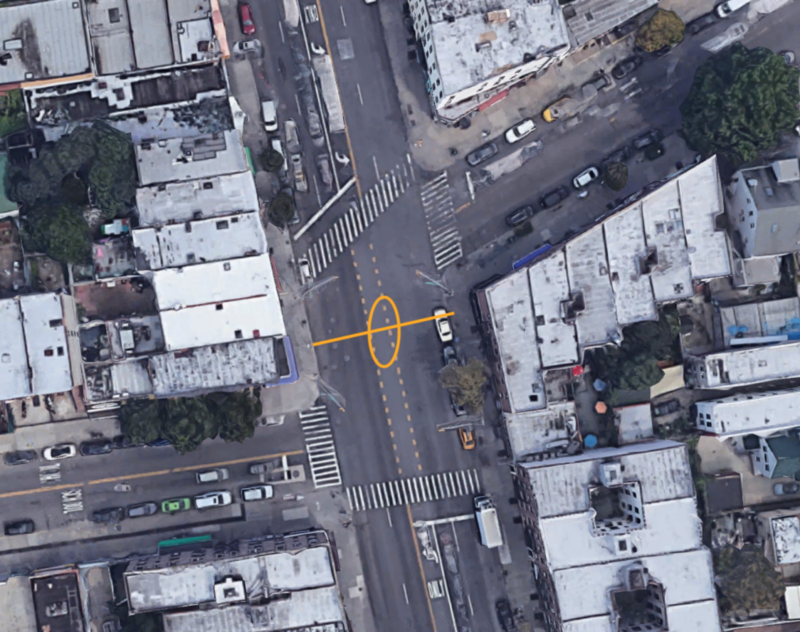 DITMAS PARK/KENSINGTON – After more than a decade of saying nothing could be done, NYC DOT revealed last week it has a plan to drastically change the intersection that has been frustrating neighbors for years. Work is expected to start in September. 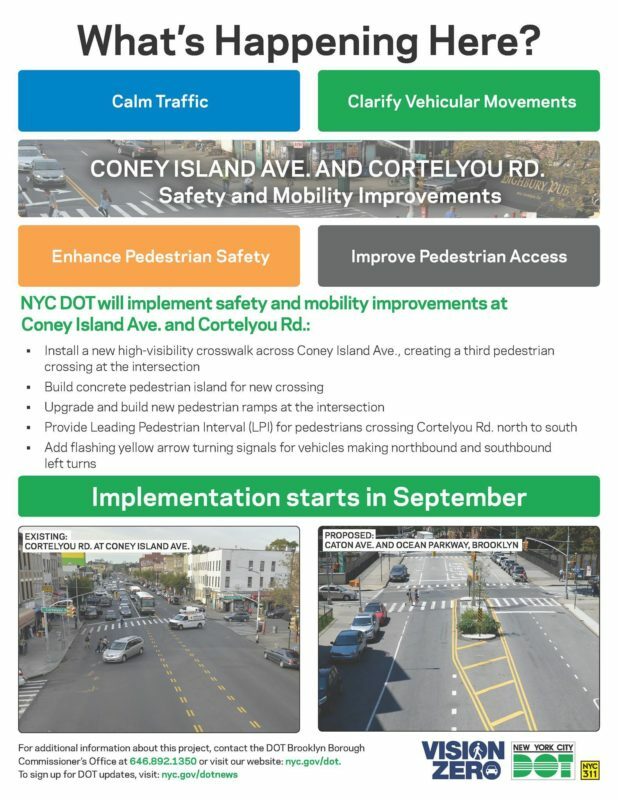 The NYC DOT posted on FB and sent to Community Board 14 the above flier, which informs that a third crosswalk with a concrete pedestrian island is coming to the intersection to formalize the route so many take informally, crossing from Highbury Pub to the Deli/Mondays Off on the other side of Coney Island Avenue. There has been no public discussion of this proposal. This is where we expect the island and new crosswalk to be, based on DOT descriptions. The new crosswalk will have a separate traffic light, but no detail on how it will be timed with the others. 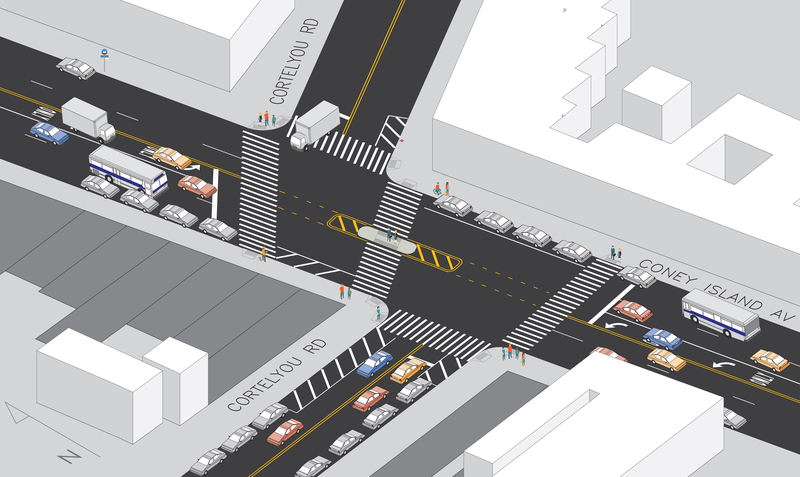 They are adding a concrete pedestrian island in the middle of the crossing on Coney Island Avenue to shorten crossing distances, provide refuge for pedestrians, and calm left turns by making them quite narrow, it seems. It is unclear where exactly the crosswalk would be and whether this means that a parking spot by Highbury gets eliminated. “The project will also include flashing yellow arrow left turn signals for the northbound and southbound directions. At the beginning of the green signal phase for Coney Island Avenue, left turns will be held for seven seconds before a flashing yellow arrow, giving pedestrians a head start to cross before left turning vehicles proceed,” a DOT spokesperson told us – a step in the right direction though not a dedicated left turn. 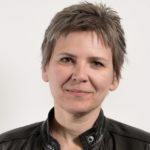 Hopefully, accidents like this will become less frequent, and this redesign is nothing but good news for the businesses on the North – East corner of Cortelyou and Coney like Monday’s Off and Maria Y Ricardo’s Taqueria as patronizing them will be a lot easier. Nothing about getting those trucks off of Caton Avenue or at least getting some NO HONKING, NO SPEEDING, and LOCAL TRUCKS ONLY signs eh? This is great, too.. but there are several schools on Caton along with the Parade Grounds, which attract lots of CHILDREN. I also don’t see the comparison between Caton & Ocean to Cortelyou and Coney.. it’s actually pretty easy to cross Ocean Parkway if you wait for the light so you don’t get crushed by an 18 wheel tractor trailer truck. “My constituents on Caton Avenue are infuriated by the presence of interstate trucks on their residential streets,” Councilman Bill DeBlasio (D-Windsor Terrace) said. “At a minimum, we need more enforcement and better signage. I eagerly await the results of the DOT study for a comprehensive assessment of alternatives to its truck route designation.” – DeBlasio, 2003. Glad to see they’re finally looking at that intersection! It’s scary to cross. Agree with BKTraveler – The double and triple parking at the repair shops cause incredible congestion and franticness among drivers who may have to sit through 3 or 4 lights to get through the intersection. That is unsafe for pedestrians and drivers as well. Though better than it was, these businesses still use the moving traffic lane for their business. Only one way to stop it: enforcement. Absolutely agreed. With the total lack of enforcement (I’ve spotted police cars in the “car wash lane”, so I guess that means the rest of the customers aren’t about to get any tickets) any traffic planning is meaningless because the planners aren’t taking into account the way the streets are in fact used. Interesting that there’s no info at all on their website about this. Still 2 weeks left in the month, but no work has started either. Still no work started! Update please!!! I will check with the DOT. If you go by the intersection today, they marked all the corners where the crossings will be, just on the sidewalks. But that doesn’t mean they’ll actually do anything soon as they often mark things months to years in advance. I’m guessing this might be done in phases since it also involves the middle island and signal work.